New England Patriots quarterback Tom Brady releases his new book outlining how he eats and exercises. His meals alone are more than a quarter of the nation's median household income. Brady is a genetic freak, partially because Tom Brady eats like a freak. 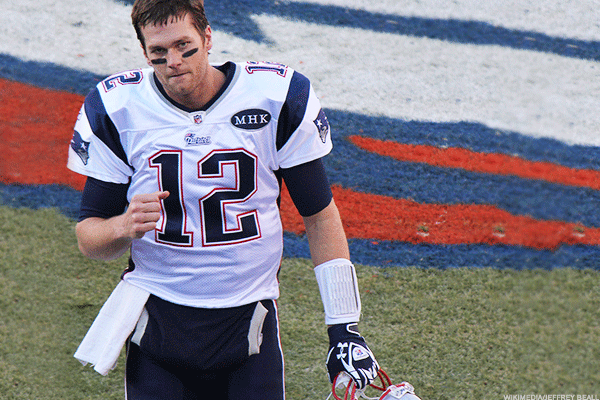 Granted, Brady eats like freak worth more than $197 million, but like a freak nonetheless. The New England Patriots quarterback is 40 years old, just won his fifth Super Bowl and is releasing his new book The TB12 Method to tell folks how he altered his diet to accomplish all of the above. While Brady has some feelings about sodium in his new book, anybody reading that book and hoping to adopt the five-time Super Bowl champion's diet at age 40 or older should take his advice with more than a few grains of salt. Brady is writing from the perspective of a man who made nearly $29 million in salary and bonuses last year alone. Brady bases his book on a life in which Under Armour, Uggs, Simmons bedding and Tag Heuer give him playing-around money for endorsing their products. Brady sends staff to the grocery store knowing that he has $30 million coming to him in the next two seasons. In short, Brady can afford a diet that's going to cost you at least $16,000 to follow. Much like Gwyneth Paltrow's Goop suggestions or Warren Buffett's McDonald's-and-Coca-Cola binges, Tom Brady and his lifestyle are backed by significant means. Brady can tell fans what he eats and how to prepare it, but that doesn't necessarily mean that they'll have the resources to do so themselves. For example, before The TB12 Method was released, Brady put out a limited-edition cookbook (or "nutrition manual," as he prefers) that cost $200 a copy. At the Patriot Place mall next to the Patriots' Gillette Stadium in Foxborough, Mass., a TB12 store sells $200 vibrating foam rollers, $150 vibrating spheres, $140 weighted vests and $80 performance mats for TB12-branded workouts. Most tellingly, though, the store offers $40 to $50 boxes of TB12 snacks, $54 cans of TB12 protein powder and $15 18-ounce jars of TB12 electrolytes (literally salt, as Sports Illustrated discovered). A startup kit of the new book, protein, electrolytes and resistance bands goes for $250. As for the daily diet itself, The Boston Globe mapped it out. Brady starts the day around 6 a.m. and downs 20 ounces of water with electrolytes: The first of 12 to 25 such servings he'll have each day. He follows that up with a smoothie of "blueberries, bananas, seeds, and nuts." He works out at 8 a.m. (more water and electrolytes) and downs a protein shake once his two-hour workout is done. At 11 a.m., he has the first of several snacks. At noon, there's a lunch of fish and vegetables, but no "white foods" (potatoes or bread) or nightshades (strawberries or peppers). From 2 p.m. to 5 p.m., Brady says he might grab another protein shake, protein bar, bag of chips, guacamole, raw vegetables, hummus or fruit, such as grapes, a banana or an apple. By the time dinner comes around, you're getting a "nutrient-dense meal that includes a lot of vegetables." That might mean burgers made out of chicken or salmon, accompanied by various salads of avocados and greens, or brown-rice pasta with cream sauce. You can make the avocado ice cream he includes, but he says he's more likely to just down another protein shake. So what does that all add up to? Well, keep in mind that the scenario Brady described doesn't include practices, games or rehab workouts. We're going to guess that the average 40-year-old isn't going to burn through as many calories or work as many muscle groups as Brady does in a day. However, let's just be charitable to Brady's TB12 scheme and say you need a container of electrolytes a week, two containers of protein each month and two full meals and two snacks each day. Fortunately for you, Brady has teamed with food delivery company Purple Carrot to deliver you three meals a week (at two servings per meal), for $78. To cover all 730 meals you'll eat in a year, that's going to be close to $9,500 in meals alone. If you salt your water with a $15 container of electrolytes each week, that's $780 annually just for water seasoning. Throw in two $54 containers of protein a month, and that's close to $1,300 a year. Now snacks make it interesting. Brady says he snacks a lot, but his boxes of snacks are limited to 12. Let's be conservative and say you have two of these snacks each day for a year. That's about 61 boxes of snacks in total, or $3,050 for the year. But that doesn't include the nuts and fruits that Brady throws into his morning smoothie each day. That requires about 30 more boxes at a cost of $1,500. Without factoring in additional fruits, vegetables fish, meats or protein powder, you're looking at more than $16,100 in TB12 dieting alone. Congratulations, you've exceeded the "liberal" Department of Agriculture's estimate for feeding a family of four with two older children for a year ($15,368.40, in case you were wondering). You're also spending more than 27% of the $59,000 that served as the median household income in the United States in 2016. Meanwhile, a person Brady's age eating like a king at home only spends $4,424.40 annually, according to the USDA. Granted, that average eater doesn't take a lot of hits and keep acid-producing foods like cold cuts, pineapples and yogurt to 20% of his diet, like Brady does. He also doesn't fill 80% of his diet with anti-inflammatory foods including Brussels sprouts, sweet potatoes, and dandelion greens. That's because your average eater isn't Tom Brady, who's likely going to eat a very un-TB12 diet himself once he walks away from football. These are the best trucks to tailgate.